Daughter of Charles, Surg.and Isabella Maria his wife. George Quilter, Alt Clerk of this parish, of Canwick of the county of the City of Lincoln, bachelor and Arabella Maria Julius of this parish spinster were married under licence with consent of parents on 14 October 1818 by me Danl C Delafosse A M Offg Minister. Witnesses: Emily Julius, Amelia Cowel (sic) Julius. Marriage Register, St Mary Magdalen, Richmond. Lincs, to Arabella Maria 2nd daur of G C Julius Esq., of Richmond Surrey. Also reported in the Examiner 18 October 1818 and Gentlemans Magazine. Caribbeana Vol 3 Pg. 334. Quilter Arabella Maria. 11 August 1885. The will of Arabella Maria Quilter late of Beverley in the County of York widow who died 3 June 1885 at Beverley was proved at the Principal Registry by the Rev Frederick William Quilter of Battenhall in the city of Worcester Clerk DD and the Rev Henry King Quilter of Bilton in the said County Clerk the son's of the Executors. Personal Estate £2190 9s 7d. 4. Arabella Maria Julius: Will, 4 Sep 1879. 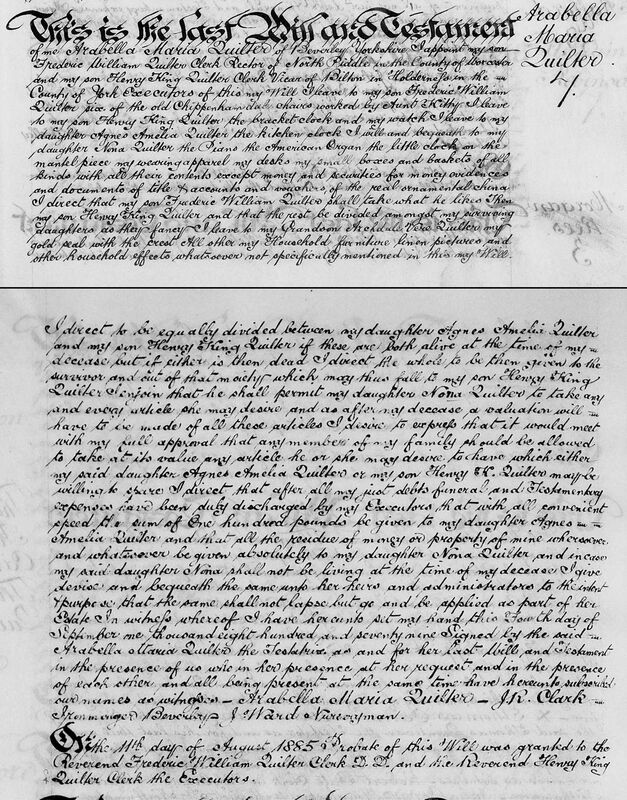 Signed by the said Arabella Maria Quilter the testatrix as and for her last Will and Testament in the presence of us who in her presence at her request and in the presence of each other and all being present at the same time have here unto subscribed our names as witnesses. On the 11th day of August 1885 Probate of this Will was granted to the Rev Frederick William Quilter Clerk DD and the Rev Henry King Quilter Clerk the executors.